We're looking forward to welcoming you to our home. We're very keen to welcome fellow runners to The Brick House Cheriton. This winter has provided many fabulous days for running in the South Downs National Park, on tracks and trails accessible right from our door. As well a some a little further afield. This week in particular, it feels like spring has arrived early. Here's hoping we don't get a beast from the east this March. If you're in training for any events this year, be it a 5 or 10k race, a marathon or an ultra, (such as Race to the King which passes a mile or so from here) the Brick House Cheriton is an ideal training base. Not only can we provide spacious rooms with comfortable king size beds and en suite shower, but you can be sure of a healthy breakfast to set you up for the day. Run from the door, self guided, guided or supported by us, over just about any distance you choose. Alternatively, you can drive or take the frequent bus service to a start point and run back across the South Downs to Cheriton. We've created some fabulous routes which you can download to Strava or ViewRanger apps, so you shouldn't get lost. And if running is not your thing, our trails make lovely walks too. When it's cold outside, experience baking delicious sourdough bread in our lovely warm kitchen! Join us for a day at The Brick House Cheriton, home of the South Downs Sourdough Bakery School and get hands on with sourdough bread making. Our very own artisan baker, Mark will guide you through the process with tips, techniques and lots of practical advice. 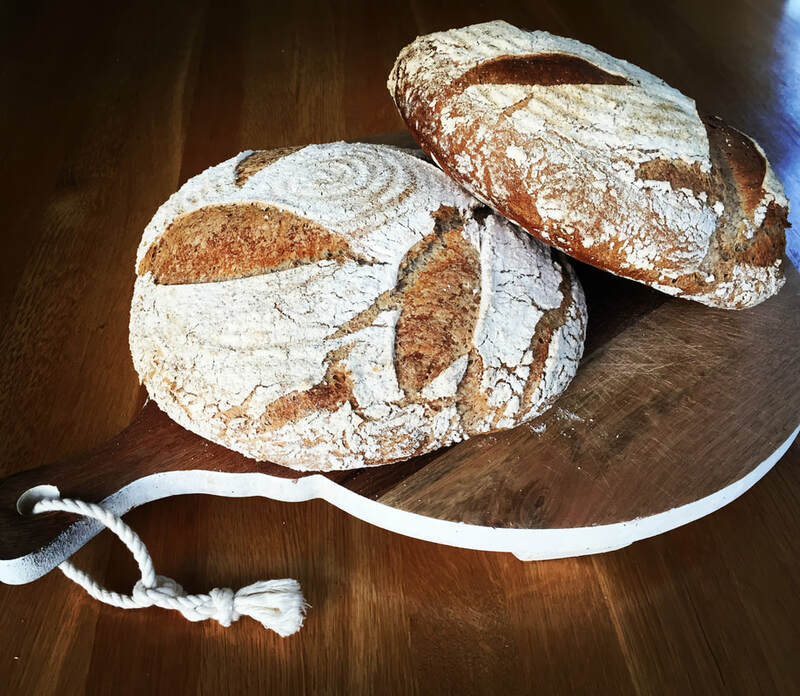 You'll take home your creations, in the form of a 100% Sourdough Rye loaf and a Wholemeal loaf made with stone ground wheat flour from the watermill in Winchester. You will also start your own sourdough starter, so you can continue your sourdough journey at home over the following days, weeks and months. We have a few places remaining on courses on 9 February and 16 March so get in touch soon. Or contact us to explore alternative dates to suit you (minimum of two places required). We also offer bed and breakfast accommodation, ideal if you live further afield and want to use this opportunity to bake bread and visit the South Downs. Trails in good shape for winter cycling! much of which is off road or on quiet country roads. At The Brick House Cheriton we not only offer fabulous accommodation and delicious breakfasts, we can also advise you on a vast selection of route choices or guide you on rides to suit your requirements. Secure cycle storage is available too. And if off road cycling isn't your thing, there are miles of quiet roads for road cyclists and abundant footpaths for walkers and runners. Get in touch soon to plan your visit. It's been a while arriving but it seems Spring is finally with us. The forecast for the forthcoming May bank holiday weekend looks good. At The Brick House Cheriton we're looking forward to welcoming guests who are cycling and walking The South Downs Way. The bluebells have thrust themselves out of the ground in the last week or so, creating a carpet of blue beneath a bright green canopy of beech leaflets. This is always such a special time but this year the flora seems to be racing to catch up, after being held back by cold temperatures for so long. One of our favourite walks from The Brick House takes in Joan's Acre and the Dutton Estate, South of Hinton Ampner House and Gardens. A delightful walk at any time of year, the bluebells at this time make it quite magical. If the sight of a carpet of blue amongst tall Beech trees is what you're seeking, then there are an abundance of opportunities within easy reach of The Brick House Cheriton. Let us help you plan some spectacular woodland walks in and around the South Downs National Park, get in touch today. A great time to go for a walk in the South Downs. Walking in The South Downs is such a pleasure at any time of year, and although it has been wet underfoot recently we have already had some beautiful winter walking opportunities this year. Now with a cold spell forecast for the next couple of weeks, the wet will be locked in as ice and we can expect blue sky days for some exhilarating walks. Just imagine the crisp air, the frosted hedgerows and the frequently changing views of the South Downs. 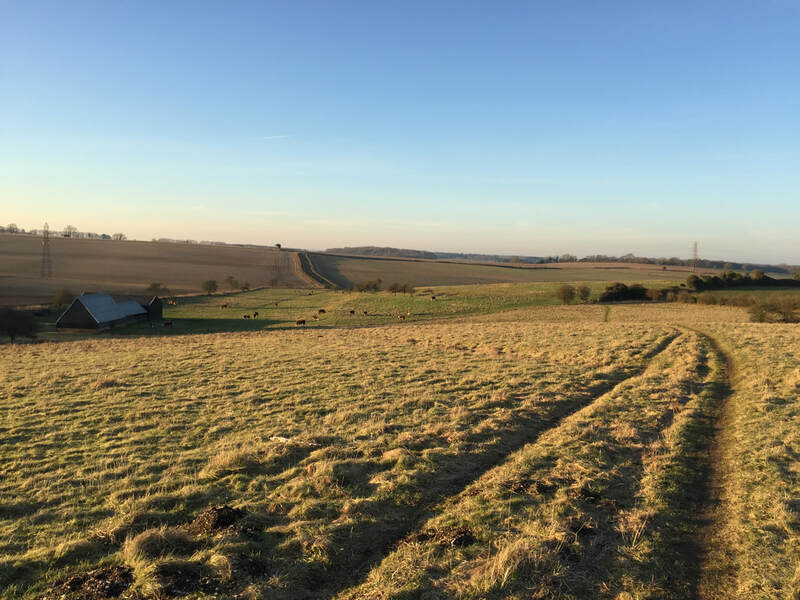 Regardless of whether your idea of a good winter walk involves any of the long distance paths that criss-cross The South Downs, or perhaps a circular route finishing in a welcoming local pub, now's the time to get your boots on. At The Brick House Cheriton we can provide you with excellent Bed and Breakfast, as the base for your walking adventures. Also, we've maps, guides and recommendations to support your plans. Ask us about our guided walking package too. Whether your winter walk is a good excuse to visit a couple of welcoming pubs, or to fulfil an ambition to complete the South Downs Way / Hangers Way / Monarch's Way / Wayfarer's Walk / Itchen Way (just to mention a few) get in touch and start your adventure with us. Get on your bike for a South Downs delight. The Tour de France is well underway now and although not visiting our shores in 2017 there will be considerable interest in the event from British cyclists. And just as Wimbledon encourages uptake of tennis at this time of year there seem to be more cyclists passing the front door of the Brick House this month. And what a fabulous time can be had on the peaceful roads and lanes of the South Downs. For off-road enthusiasts there are also miles of dry (at present) trails over the chalk down lands and occasional downhill delights on single track. We can suggest routes to take-in hills if climbs or descents are your thing, or more gentle routes with views of the Downs and the Hampshire Hangers (dramatic steep sided valleys). You're never too far from a pub or tea / coffee shop either. So, if you come and stay with us, you can set off after a satisfying breakfast, follow well thought out routes (using paper or downloaded maps) designed to suit your cycling ambitions. You'll visit some beautiful parts of Hampshire, West Sussex and the South Downs including some delightful pubs or cafes, before returning to Cheriton. This really is a fabulous area for cyclists. Get in touch to book today! We're well into festivals of all types in the Winchester area. With the Alresford Watercress festival, and Alresford music festival already behind us, we've also had Winchester's CycleFest as well as a Festival of Gin but those were just for starters! Underway now is the new Grange Opera Festival at the Grange, Northington. This weekend sees family friendly Winchestival at the North Walls recreation centre. And at the end of the month it is the Winchester Hat Fair - the UK’s longest running festival of outdoor arts. July will bring the Winchester Festival combining music, talks, drama and visual arts at venues across the historic city of Winchester. With Graze, Boomtown and the Wickham Festival's all taking place in August popular music lovers will be spoilt for choice. Take a look at the Visit Winchester micro site at http://www.festivalsinwinchester.co.uk/ for more details of all these events and some I have probable omitted. So much to do and enjoy around here! We are now well into Spring in the South Downs and the Bluebells are tremendous this year. Walks near the Brick House Cheriton are quite spectacular, and the air is filled with the smells of the Bluebells and Wild Garlic. Do visit soon and experience this festival for the senses. 2017 Run / Bike / Walk package. A New Year, "A New You"! A time for New Year resolutions - but do we make them? Or keep them? Sometimes we just need a bit of help getting started. One thing is for sure, this is a great time to get out and about on the South Downs. So if your New Year resolutions involve getting out more, getting fit (fitter) or perhaps preparing / training for a big event, there's surely no better time or place to start than right here and right now. At the Brick House Cheriton we are offering Run/Bike/Walk weekend packages tailored to your aspirations. Two nights luxury bed and breakfast accommodation, along with two days guided running, biking (on / off road) or walking experience to suit you. If you've just taken delivery of a new bike, we'll help get you started and build confidence and skills to support your ambitions. If you plan to take on a running or walking challenge this year, we'll help get you started, and build a training schedule focussed on your goal. Or if you just want a good excuse to enjoy the South Downs in Winter we'll help you do that too. Call us now, or email Mark@brickhousecheriton.co.uk to discover how close you are to beginning your journey to the "New You"! Today is October 1st, and it is feeling like Autumn is upon us. A few showers today, but they have been in between lovely sunny spells. Tomorrow is forecast to be bright and sunny all day. Just as well as we'll both be taking part in the Clarendon Half Marathon and Relay Marathon which follows the Clarendon Way, finishing in Winchester. Autumn really is one of the most beautiful times in the South Downs National Park. the views are enhanced by the extra splash of colour as the leaves turn from green to golden. The light is special too, without having to get up too early to enjoy it. We're looking forward to welcoming more guests to The Brick House to share in the beauty of the South Downs, on foot, by bike or by car. Others may prefer to visit Winchester for a sunset walk before deciding which of the many restaurants or pubs to visit for dinner.